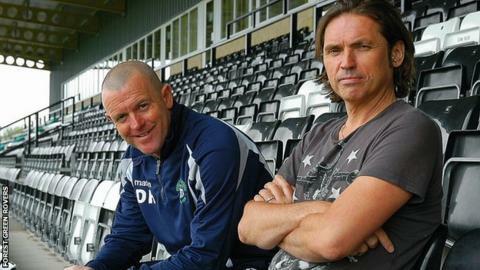 Chairman Dale Vince believes Forest Green Rovers can seal promotion to the Football League next season. The Nailsworth club have never progressed beyond non-league level and are currently the longest-serving members of the Blue Square Bet Premier. Vince, 50, told BBC Gloucestershire: "This season has been about building for the future. "We'll be in a promotion battle next season. We'll make the play-offs and I think we could win the league." He added: "We're building on this season so it will be better and everyone is right to expect that. "I expect that, the manager expects it and the players do as well." When Vince became majority shareholder at the New Lawn in 2010, Forest Green had only retained their place in non-league's top tier because Salisbury suffered a double demotion. Two months after investing in the financially stricken club, Vince - a green energy tycoon - became chairman and is credited with turning Rovers around both on an off the pitch. He decided to keep the faith with manager Dave Hockaday and two years later, the club find themselves mid-table in the league and financially sound. "I spent a lot of time talking to the manager and he didn't have the tools to do the job," said Vince, about his arrival at the club. "He had a very small budget the year I joined, he had 13 players and they were training part-time. "There were all sorts of factors that meant we were destined to battle against relegation. "We've changed all of that this season. We've got super training facilities, we started the season with a proper sized squad and Dave has had the chance to show what he is capable of. He's shown everybody - even his fiercest critics wouldn't dispute that." Vince says Rovers are now in a position to add new players to the squad in order to push for promotion next season. "We're tweaking the squad and signing three new strikers," he added. "It's one of the things we've been missing this season. We went through a spell where we just couldn't score but we'll have six strikers next season. "We've started pre-season now, that's how it feels."